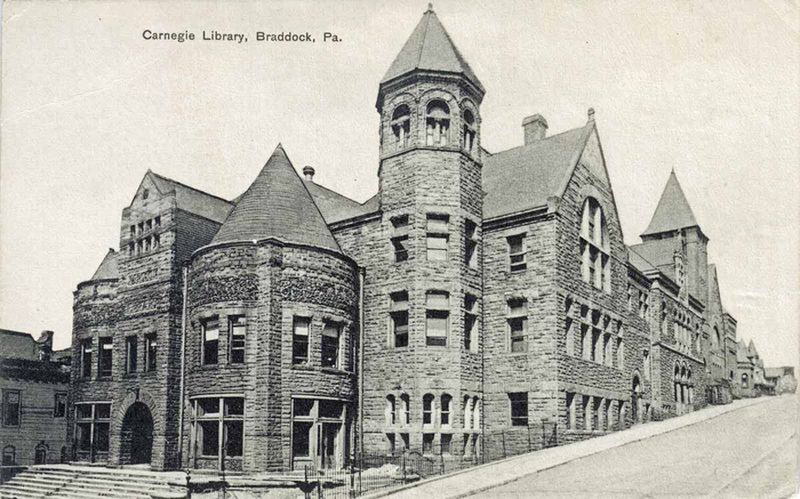 The Braddock Carnegie Library is the first Carnegie library in the country. Built in 1889 in the town where Carnegie’s first steel mill still operates, the Braddock Carnegie Library’s style and ornateness reflect the wealth of the nineteenth-century industrial boom. Today the building is still beautiful, but it also shows the scars of more recent history—industrial decline, population loss and neglect of economically challenged neighborhoods and public institutions. The Library was closed in 1974 and was slated for demolition. A group of residents mobilized at that time to save the building and bring it back into use. Other than that brief period in the 1970s when we were closed, our heart has always been and continues to be in serving our communities. Throughout our 125 years we wore many different hats to adapt to changing needs of the community. As a result of these transitions, we continue to refine our role of providing resources needed by and desired from our patrons in uplifting them and in helping them to achieve their goals. The process of uplifting requires listening, sharing, partnering, and befriending. But it results in a connection to the uplifted, a desire to uplift others, and a sense of being able to face problems with solutions rather than despair. This direct experience with drastic economic and societal change has grounded us in the knowledge that our Library is part of a value system based on culture, exchange and life-long learning for all regardless of your social or economic background. The past 125 years have been full of excitement – providing library & community center activities, saving the building from demolition, raising funds & awareness to restore the building, becoming a member of the Allegheny County Library Association which allows us to exchange materials with other libraries among other benefits, being placed on the National Register of Historic Places, being named a National Historic Landmark, being part of the Carnegie International, restoring the Music Hall, developing alternative lending collections – art, puppets, tools, providing screen printing, ceramics, & music classes. Imagine what the next 125 years can bring! To learn even more, view the Braddock Carnegie Library Wikipedia page here.